*Let me begin by saying that I in no way claim to know Ms. Shabazz personally. The title is a witty attempt to compartmentalize my experience attending Shabazz’s book signing in celebration of her new book X a Novel, while commemorating what would have been the 90th birthday of her father Malcolm X.
I first cast my eyes on Miss Ilyasah Shabazz at a podium at the Roosevelt Library in Long Island, New York. Shabazz stood in a scene eerily similar to the final moments of her father Malcolm X, fifty years prior with a face reminiscent of the late leader. She spoke of her three books, her reason for writing then and perhaps most significantly, the influence of both her mother and father. Just two years old when her father was murdered just before her young eyes, Shabazz emerges as a testament to the ability to overcome adversity with greatness. Malcolm X, with his elevated ability to articulate advanced ideas with ease, was the first face I recall from my childhood lessons on black culture- issued by none other than my father. The Eyes on the Prize videotapes captured the courage, power and charisma that is Malcolm X. In fact, Malcolm X was my first crush, as he had something that the hearthrobs of the nineties did not. Perhaps what crafted his greatness was not this “something extra,” in itself, but that he did not seek to keep this to himself- rather he extended his gift to his community. The influence of the incomprobable Malcolm X transcends both life and death, as a gleam of his light shines through in the eyes of his daughter Ilyasah Shabazz. While my efforts pale in comparison to Miss Shabazz, we endure a shared experience as we are both female writers. 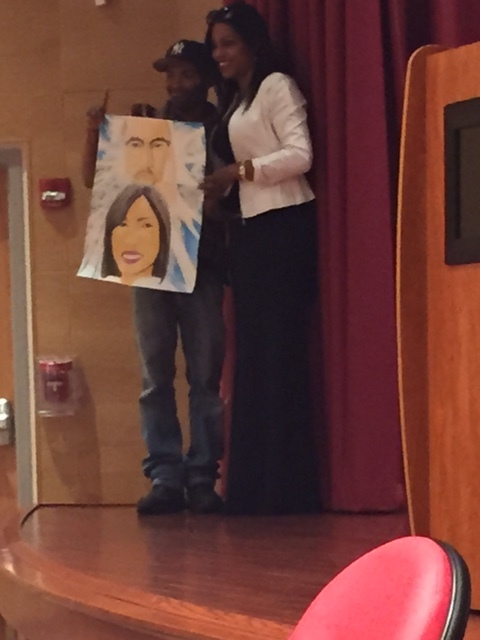 Thus, meeting and hearing Ilyasah Shabazz speak was a powerful movement in my journey as a writer and a black woman. Shabazz cites the motivation for her authorship as a means to assert her authority. As her father’s speeches and autobiography would change the lives of all who intertwined their minds with his words, Shabazz would seek and influence of the same sort in her writing. As an author, Shabazz-a black woman, is a producer of her own legacy. 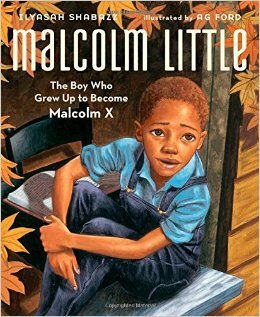 She not only ensures the accuracy of her parent’s legacy, but Shabazz’s offers the essentiality of an unsullied black history. Shabazz’s journey for black production of black images is demonstrated through her children’s book Malcolm Little: The Boy Who Would Grow Up to Be Malcolm X. Shabazz challenges the disturbing pattern of African American characters as “evil” or “downtrodden.” My heart lit up when Shabazz spoke of an upcoming book loosely based on the life of her late mother: Miss Betty Shabazz. The upcoming children’s book focuses on a little brown girl and how she came to be the wife of a resounding leader, all the while become one herself. To say that Miss Shabazz’s efforts are inspirational would be an understatement. Miss Shabazz epitomizes the power in preserving the legacies of all whom have come before us. As the daughter of Malcolm X and Betty Shabazz, Ilysa’s plight may be overtly personal, but we are all personally better off because of the collaborative efforts of her parents and herself. May Miss Shabazz be an inspiration for all those within the black diaspora to enrich our future with the strength of our past. While we may be without the royalty of our origins, let us regard our heritage as heirlooms. Beautiful post! Malcolm would be proud!